When the National Geographic logo appears onscreen before a film's opening credits, you might immediately think "documentary." To some extent, you'd be right. 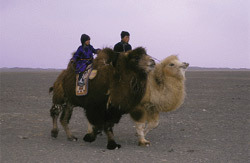 But if the film is The Story of the Weeping Camel, after just a few minutes of patience, you'll find yourself in the midst of a unique fictional film with a documentary feel, a touching curiosity about an extended family of Mongolian camel herders in the Gobi desert. A popular entry in a handful of recent film fests, Weeping Camel is a simple, provincial story with a universal theme and knockout photography. The creation of two Munich Film School students, the film is as intriguing as any polished documentary, and has a tale even a Hollywood film fan can relate to.